One of the great joys of being part of the choir is the chance to travel together. Often this is to competitions, but occasionally we have the opportunity to take part in music festivals. In 2013 we went to Barcelona, and in 2017 we took part in the Fourth Vienna Music Festival. The two concerts were both on Saturday October 28th, but a number of the choir took the opportunity to fly out on the Thursday, or early on the Friday, in order to enjoy some sightseeing, with a few lucky people able to extend their break into the following week. 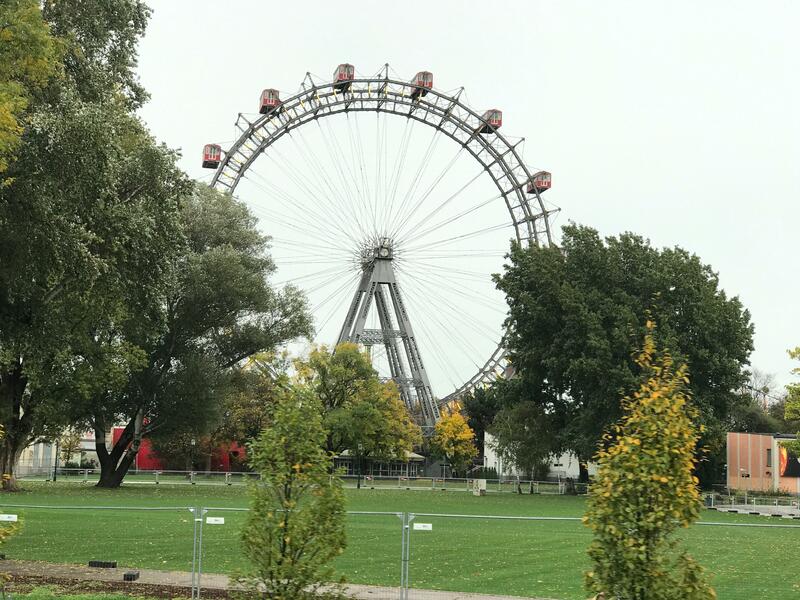 Vienna is, of course, a wonderful place for tourists, and a number of us enjoyed the delights of the Grand Ferris Wheel in Prater Park. 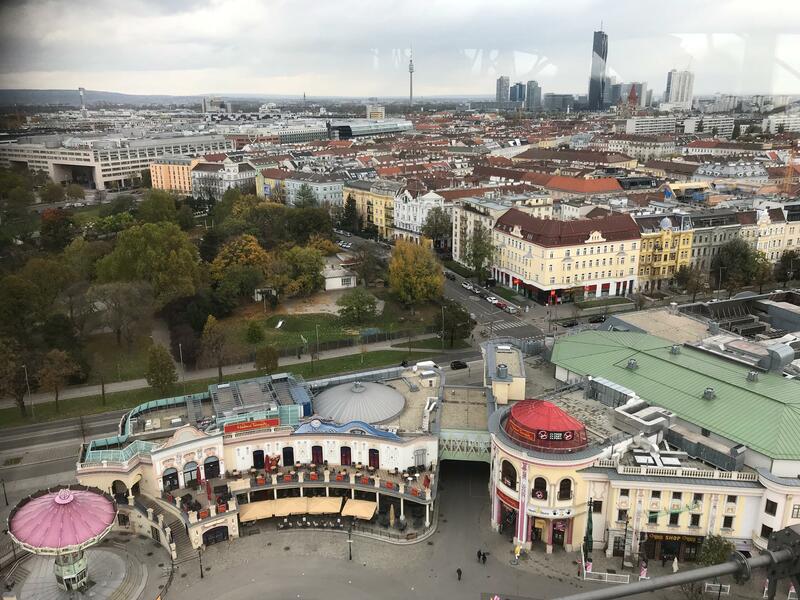 This allows wonderful views from 212 feet above Vienna, and at least one member of the choir found himself humming the famous theme tune from The Third Man as he waited in the queue to board. Another sightseeing highlight was the Spanish Riding School. Most of us who went were not able to see the main display, which was on when we were preparing for the evening concert, but it was fascinating to see the horses put through their paces, including being taught to balance on their back legs, and practising many of the skills familiar from the Olympic dressage events. 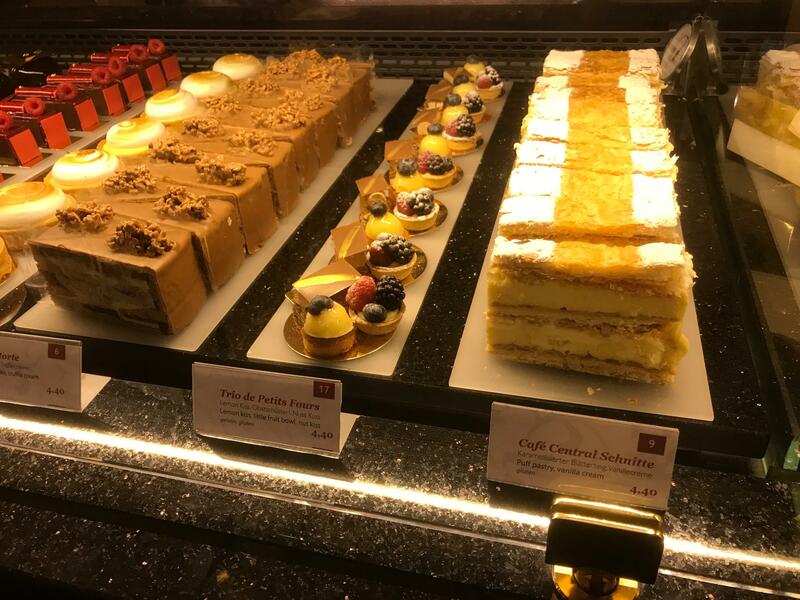 And of course, the food in Vienna is magnificent: we weren’t going to miss the opportunity to enjoy some of the fabulous restaurants and cafés. The Griechenbeisl is Vienna’s oldest restaurant, with a variety of oddly shaped dining rooms, with wonderful wooden beams and antique artefacts on the walls. As this was a favourite of Mozart, Beethoven and Schubert among others, many of us felt it would do nicely for us. Another choir favourite was the Café Central, with its lifesize statuette of a moustachioed man greeting customers at the entrance. 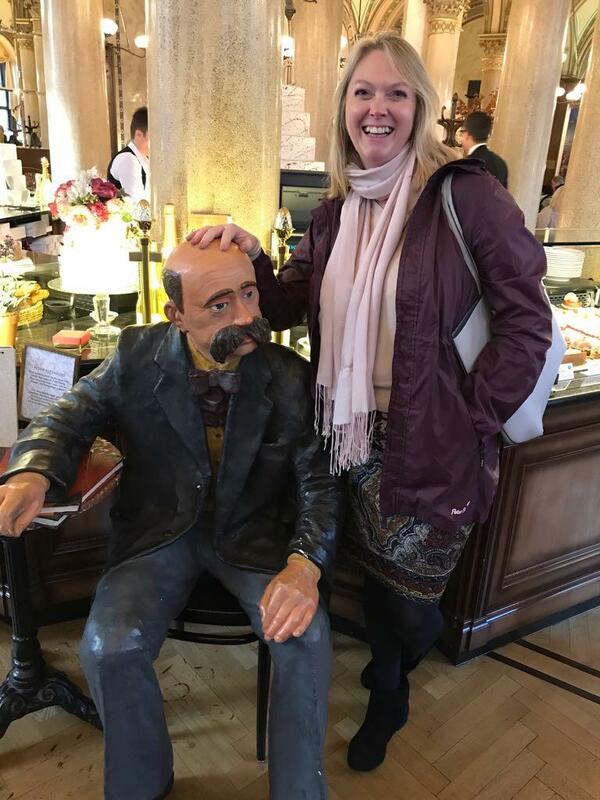 While we didn’t manage to sample the full range of magnificent cakes there, between us we did consume a good number, including the famous Sachertorte. But the main reason for being in Vienna was to sing. Our first concert, on the Saturday morning, was in the magnificent Votivkirche, with its beautiful twin spires and rich acoustic. There we met for the first time with the Vocal Blue Trains choir from Italy. We loved their programme; ironically enough, of the three choirs taking part in the festival, the Italian one was the only one to sing entirely in English! We enjoyed their engaged, lively performances of Scarborough Fair and Total Praise among others. Our own pieces were Hassler’s 16th century Verbum Caro Factum Est; Stanford’s staple of the nineteenth century English choral tradition, Beati Quorum Via; our long-time favourite, MacMillan’s O Radiant Dawn; John David’s You are the New Day, in the Kings Singers arrangement; and Ola Gjeilo’s haunting setting of Ubi Caritas, which our new Italian friends paritucalarly praised. In the evening we sang at the Ehrbar Saal concert hall, adding Ian Assersohn’s Soles Occidere, Eric Barnum’s Sweetheart of the Sun, and Whitacre’s With a lily in my hand to our morning repertoire. As well as the Italian Choir, we were joined by the Wiener Gemeindebauchor, most of whose repertoire consisted of traditional Viennese folk songs, waltzes and polkas. Their set exuded a love for Vienna, and the delight on their faces as they sang Wien, du Stadt meiner Traüme (Vienna, city of my dreams) was infectious. 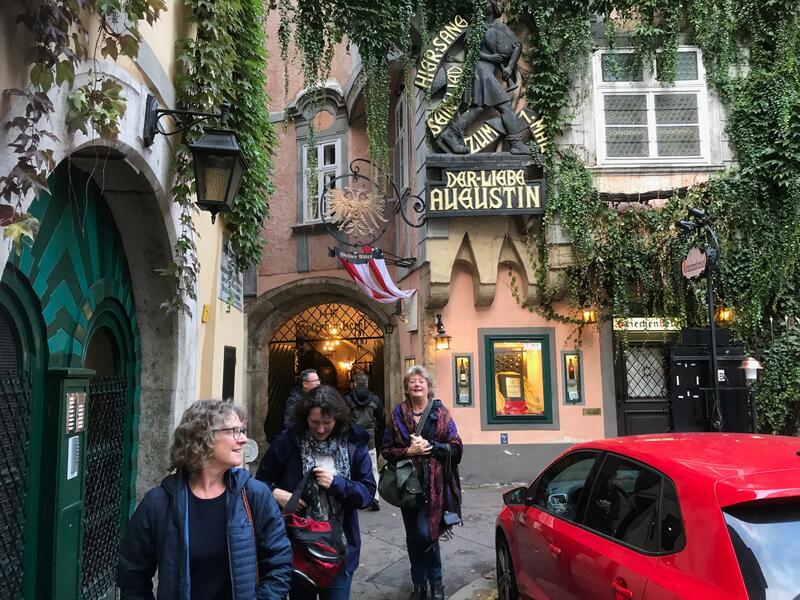 The trip finished with a meal at Der Bettelstudent, a lively bar restaurant, made even more raucous by the choir after numerous pints of lager and bottles of wine had been consumed along with the Wiener Schnitzel and other delicacies on offer. As well as a first trip aboard with the choir for those who joined since 2013, it was lovely to welcome some newcomers into the choir, including Catherine and Kelly who have both decided to stick with us and are now well established members. As always, all of the choir are immensely grateful to Debbie for the huge amount of work she put into the trip, not just in training us up for the concerts, but with all the organisation involved. In all, it was another great event enjoyed hugely by choir and audiences alike.